27-year-old Aravinda is a postgraduate in social work. His father worked very hard, with his Rs. 300-a-day income to educate him this far. The only motivation he had was the dreams of a day when his son would grow up and live a life that is unlike his -- free of financial struggles, with no insecurities and most of all, happy. But life had other plans for Aravinda. Aravinda's father is a daily-wage labourer who earns Rs 300 per day if there is a job available. During Aravinda's childhood, with great difficulties, he used to manage the expenses of the family. Aravinda has been a fighter all his life. He grew up in a small town called N.R. Pura in north Karnataka with limited options and facilities. 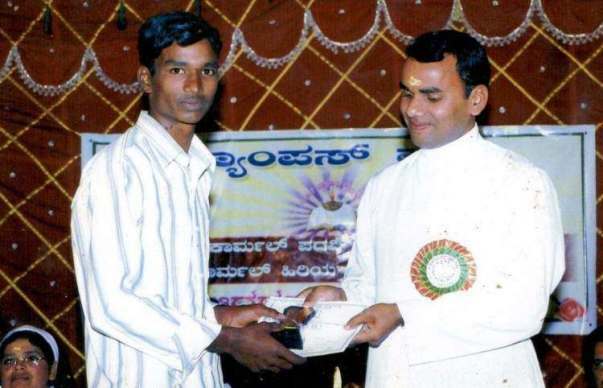 However with his sheer determination and hard work he topped his school and managed to get a merit-based scholarship in college. Aravinda was regularly falling sick. He used to throw up often and faced difficulties in digesting food. He was then referred to HCG hospital, Bangalore and after a thorough round of tests the doctors gave the family the awful news. Aravinda was diagnosed with Metastatic Desmoplastic Round Cell Tumour (MDRCT), a rare aggressive cancer. Doctors suggested that he undergo several rounds of chemotherapy as his condition was extremely critical. Aravinda has received 12 cycles of chemotherapy for 6 months and has shown a good response to treatment. 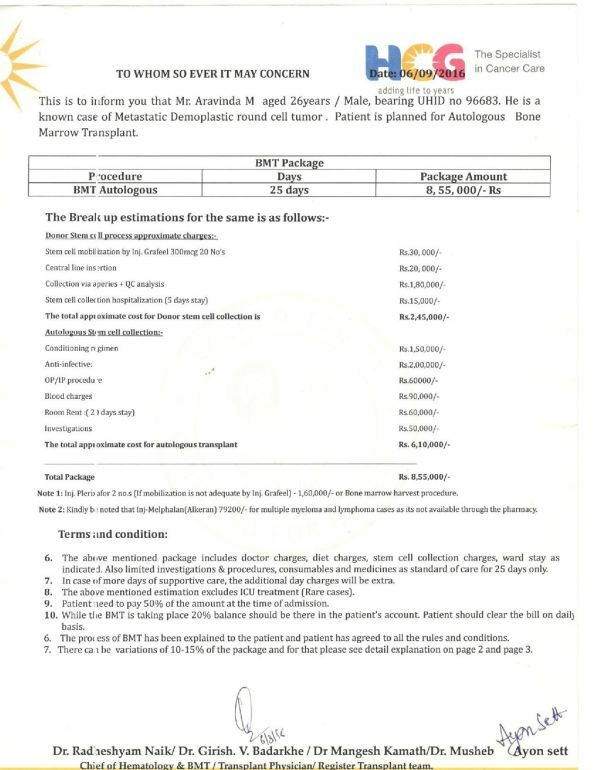 He is now planned for ASCT (Autologous Stem Cell Transplant), which is estimated to cost Rs. 8.55 lakhs. 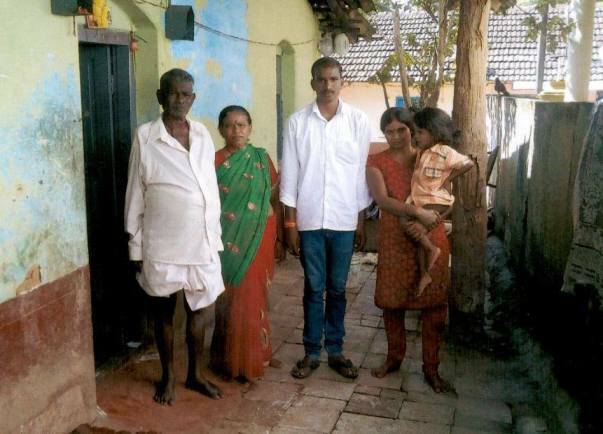 The family was hopeful that Aravinda would be cured of the disease. 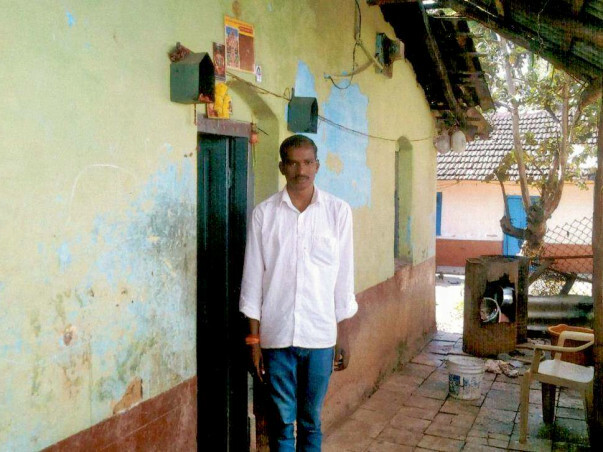 To ensure he got the treatment he needed, Aravinda's family sold their home. Even that fetched them only Rs 4 lakhs. Now, they are unable to fully fund the cost of Aravinda's treatment. 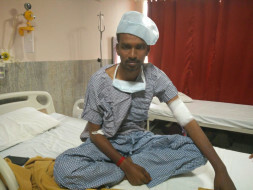 Aravinda needs to undergo the bone-marrow transplant and take medication for at least three more months. He has fought this battle bravely. Though he looks frail and weak, his grit and desire to change the world pushes him to fight this battle. Due to financial constraints, Aravinda is not able to undergo the procedure. The family has arranged Rs. 4 lakh by selling their house (since that was all they had) and have approached HCG Foundation for financial aid. Your contribution can give this brave, promising young man a second chance to live. 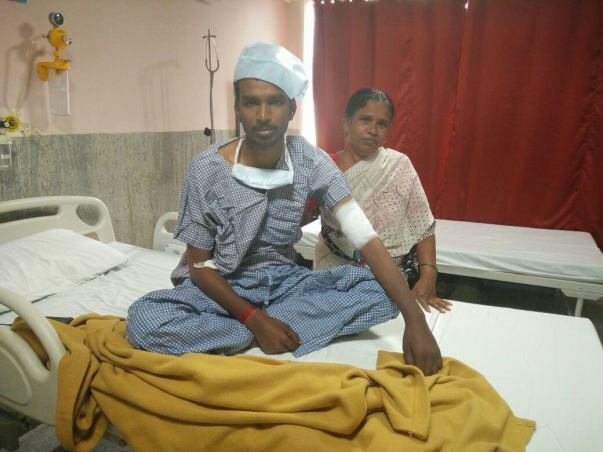 After the check up Dr. suggested undergoing one more chemo instead of PET CT.
Aravinda underwent a 4th cycle of chemotherapy on 30th May 2017 and got discharged on 31st May without any complications. Thank you so much for coming forward to support us. Aravinda's BMT Procedure costs more than 4 ,50,000. He could not raise that much money from different source of donations. So instead of doing BMT at the moment Doctore suggested him to continue Chemo therapy He just finished 3rd cycle of chemotherapy on 9th May 2017. Aravinda will be coming for PET CT on 16th May 2017 and Doctor will suggest further treatment. Thank you so much for coming forward to help Aravinda. He is currently in his 5th cycle of chemotherapy and is taking it pretty well. Apart from the hair loss, he is stable. It has been identified that the cancer has started to progress and he was immediately put on a tablet called Votrient. He now needs to undergo a stem-cell transplant and has undergone a blood stem cell collection in October 2016 for the same. Please do help Aravinda live and share his story with all your friends and family. Get well soon and help needy people.